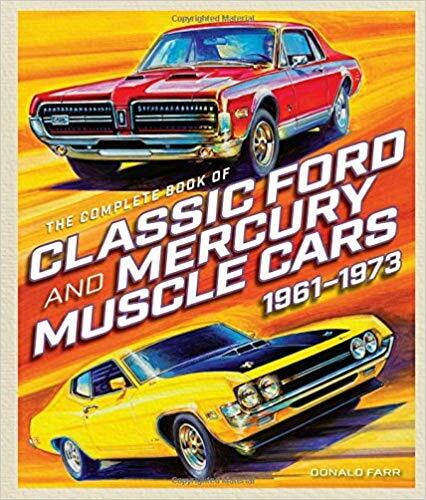 The Complete Book of Classic Ford and Mercury Muscle Cars by Donald Farr is a new book about about the Muscle Cars of Ford and its sister division Mercury, in the classic era from 1961 to 1973. It covers the entire spectrum, from the beginnings with high-powered full-size cars to the intermediates and pony cars, up to the end in 1973 when insurance, emissions and the oil crisis put an end to the classic Muscle Car era. An extra chapter is devoted to Shelby. What I really liked are the extracts from contemporary tests by magazines. The photography is top-notch. The layout looks great, too, much nicer than in some of my older Muscle Car books. Each chapter ends with performance figures for all the engines mentioned in the chapter, including quarter-mile figures taken from contemporary tests. My only complaint would be that the chapters on pony cars are a bit short, but I understand the author’s decision to focus on the high-powered engines and omit the base V8 models. Highly recommended!